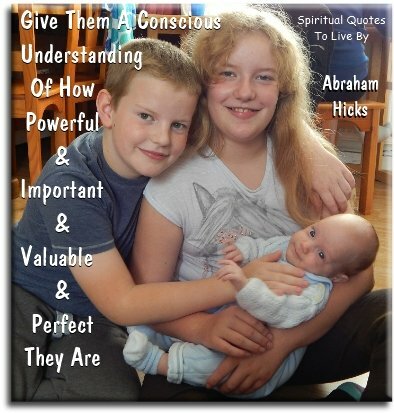 Abraham-Hicks quotes about children are essential guidance if you are wanting to bring up your children using the knowledge of the Universal Law of Attraction. What better start can a child have in life than to be surrounded by loved ones who are always focusing on doing their best to be aligned to their own Source Energy. But, remember that no one can be positive all the time, it's okay to not be. Just aim to do your best, it's all any of us can do. If you have a bad moment/day move on, forgive yourself and in the words of a popular children's song "Let It Go." Children coming forth today have a greater capacity to deal with the greater variety of information that is coming forth than you did. If our children were saying to us "I don't know which way to go, what should I do Mommy?" We would say, if we were standing in your physical shoes... I think you do know which way to go, and I trust that you'll figure it out, and if you figure it out, and I believe you will, you'll feel ever so much better than if you just do what I think you should do. I think you know and when you figure out that you know, NOW your live's gonna be fun. It's natural for them to live happily ever after, and it's all this pandemic stuff that's being force-fed to you that makes you then pass it on to your children. It's natural for them to thrive and if you train yourself into expecting that, then you'll inspire them into expecting that and then they must thrive. 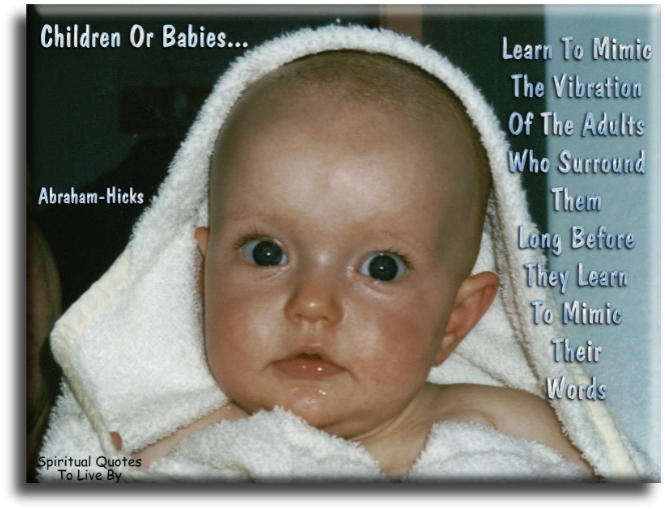 Most people don't think that new-born children could be the creator of their own reality, because they are not even talking yet. But the Universe is not responding to your language anyway, the Universe is responding to your vibration. A demonstrator: A consistent, constant demonstrator of being in your own vortex. The child is vibrationally receiving your fears, your beliefs, even without your spoken word. If you want to do that which is of greatest value for your child, give thought only to that which you want, and your child will receive only those wanted thoughts. The most important thing that you can teach your children is that Well-being abounds. And that Well-being is naturally flowing to them. And that if they will relax and reach for thoughts that feel good, and do their best to appreciate, then they will be less likely to keep the Well-being away, and more likely to allow it to flow into their experience. They are Beings who want to feel joy, who want to live a joyous life experience, so when you hold that as your object of attention and you use that for your reason for alignment, then you are a powerful catalyst that influences that in their experience. We’re going to tell you a very big secret about children: They are freedom seeking in a way that you have not yet experienced the desire for freedom. The youth that is coming forth in this time are poignantly coming to express their ability to be free. What your children will benefit most from you is... if they can begin to see the same freedom seeking being in you, that they feel in themselves. 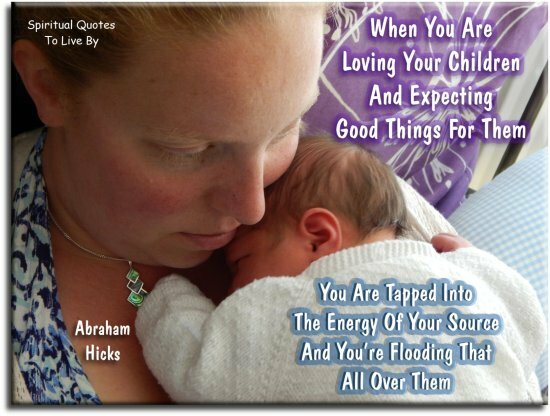 When you are loving your children and expecting good things for them, you are tapped into the energy of your Source and you're flooding that all over them. When you worry about your children you've separated from who you really are because your Inner Being will never worry about your children. Your Inner Being always expects the very best for your children. 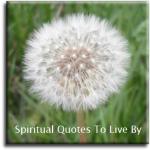 Wish for them to be joyful, wish for them to be happy, wish for them to be in alignment and let your every utterance be toward the end of being a catalyst to helping them connect to their own Inner Being. You can't create in the lives of your children, they create their own reality, but when you worry on their behalf and you activate negative things in your vibration that have to do with them, then it's more likely for those negative things to be activated in them and then it's more likely for them to attract those negative things into their experience. You can't do anything about your adult children. You can want better for them, but you cannot do anything about someone else's vibration other than hold them in the best light you can, mentally, and then project that to them. And sometimes, distance makes that much more possible than being up close to them. You've got to think thoughts that uplift you before you have anything to give your children.